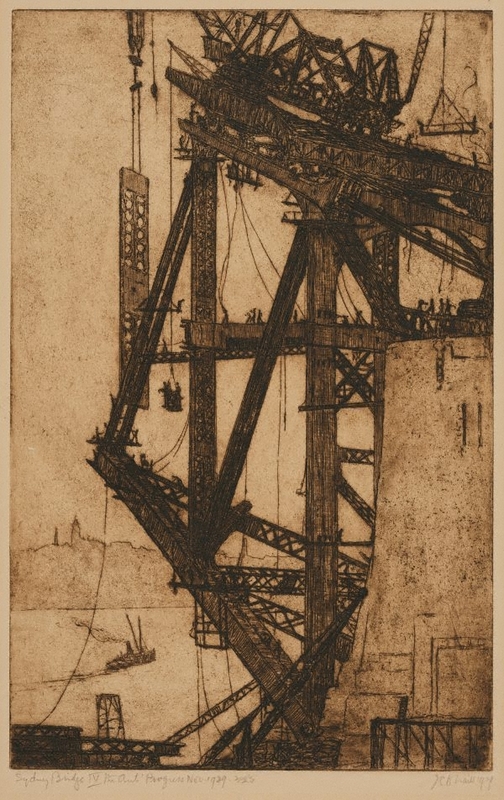 The Gallery has the complete set of Jessie Traill's celebrated series of etchings depicting the building of the Sydney Harbour Bridge, completed in the years 1927 to 1931. Traill's interest in this complex engineering feat was shared by a number of artists, including her close contemporary Grace Cossington Smith, attesting to the central place the construction of the bridge had in the life of the city. Signed and dated l.r. beneath platemark, pencil "JCA Traill 1929". Deborah Edwards and Denise Mimmocchi, Look , 'Sydney Moderns', pg. 24-28, Sydney, Jun 2013, 24 (colour illus.). Peter Emmett, Sydney: metropolis, suburb, harbour , 'Metropolis', pg. 13-70, Glebe, 2000, 49-50 (colour illus.). Bruce James, Art Gallery of New South Wales handbook , 'Australian Collection: Works on Paper', pg. 182-197, Sydney, 1999, 193 (colour illus.). Bridging Sydney , Sydney, 2006, 207 (colour illus.). AGNSW Collections , 'From Colonialism to late Modernism', pg. 7-106, Sydney, 1994, 36 (colour illus. ), 37. Denise Mimmocchi, Sydney moderns: art for a new world , 'Icon of modernity: the Sydney Harbour Bridge', pg. 154-163, Sydney, 2013, 161 (colour illus. ), 316, 324. Macushla Robinson, Stars in the river: the prints of Jessie Traill , 'Building the Harbour Bridge series', pg. 52-61, Canberra, 2013, 9, 58 (illus. ), 59, 107, 115 (illus. ), 146, 171 (illus.). NOTE: The text on page 107 speaks generally about Traill's Sydney Harbour Bridge works. 'Building the Harbour Bridge' series is specifically discussed on pages 56-60.